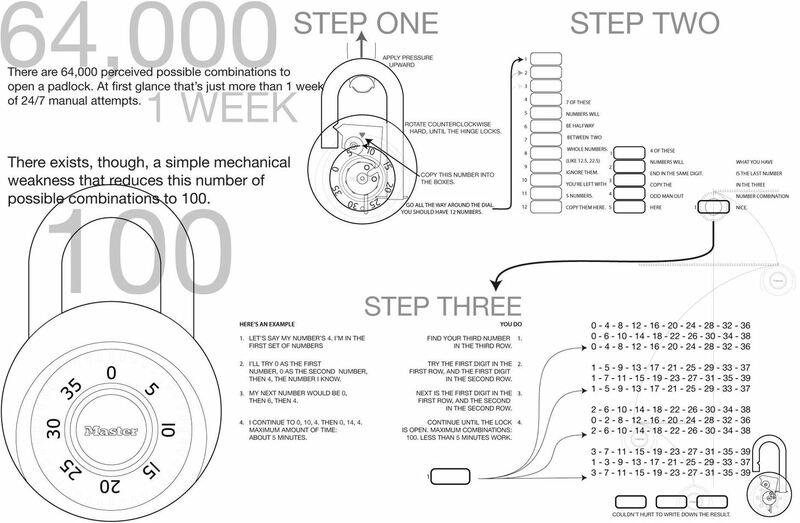 Apparently it is possible to reduce 64,000 possible Master Lock padlock combinations down to just 100. The entire process is clearly illustrated in the below how-to from Mark Edward Campos. For an enlarged version, click here. Looking for something a little more interactive? We have loads of lock-picking tutorial videos. Here's one that demonstrates the same method (math as opposed to shim) outlined in the above illustration. What about the third group? Shoudln't the 2nd digit on the 2nd line be a 4? And the fourth group. Shouldn't the 2nd digit on the 2nd line be a 5? I'm assuming the first digits in each row are correct. I don't know. Can the originator please straighten this out for us? You are a rockstar... I just spent 3 hours watching you-tube videos and none of them were even close!! Thank you!